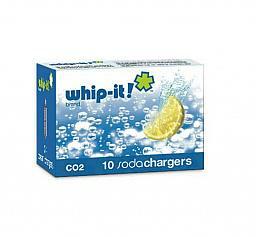 Cream whippers and charger systems are invented by Whip-It's original manufacturing partner in Switzerland in 1950's. 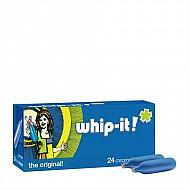 Whip-It! 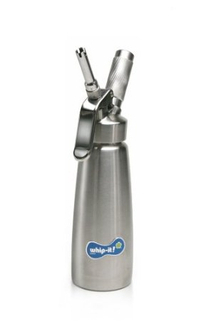 Brand whippers and chargers reflect over 60 years of manufacturing expertise and the brand name is synonymous with the "cream charger" product category itself. The Whip-It! 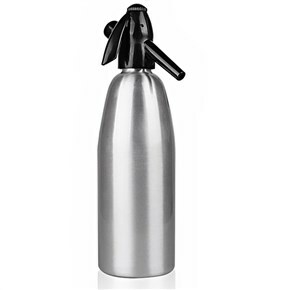 brand cream chargers are made out of the finest steel available and must pass through several stringent cleansing processes before being filled with nitrous oxide. The gas not only qualifies for "food grade" standards, but it is further purified to the "Swiss medical standard" which is the highest in the world. This contemporary screw valve soda siphon design is a modern addition to your bar. Discover the refreshing fizz of purest soda water, and prepare a variety of tasty drinks at your next cocktail party. Just like the Whip-It! brand chargers, these C02 cartridges are made out of the finest steel available and must pass through several stringent cleansing process before ever being filled out. The gas itself is food grade, but is further purified to the highest Swiss Medical standards.